Lettuce wraps are great both for family dinners and guests because they look fancy but are simple to make. I think of them as a lighter version of burritos, with equally vast variations. They work as appetizers or as mains – but you need to really amp-up the fillings and allow a few per person to make a meal. Get your kids excited about this dish by choosing a sauce they love, and/or by letting them build their own wraps from a buffet of toppings. My little guy always goes back for seconds and gobbles up a lot of tofu along the way. My toddlers prefer plain lettuce leaves and sauce without the messy toppings. The pictured wraps described below are our standard 30 minute version. 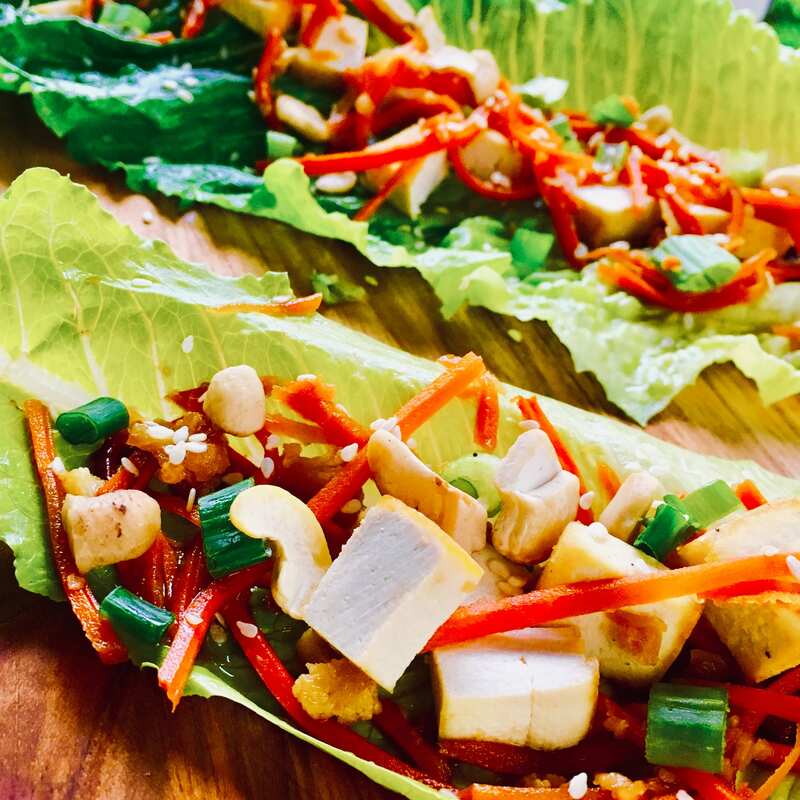 For a faster no-cook version – simply used pressed, flavoured tofu (we like sriracha or smoked from Soyganic) and raw shredded carrot rather than cooked. Flavours are not as deep but still very tasty. Pull the leaves off the romaine head and wash, then pat dry with paper towel. Rinse tofu block and press between paper towels to remove excess water. Letting it sit under a weight for a while is even better if time permits. Cut into small cubes (less than 1 cm). Sometimes I sauté in slices and chop afterwards to make the frying easier. Shred carrots and cut any other veggies you want to use into small pieces. If using vinaigrette, mix the soy sauce, vinegar, and maple syrup in a small dish. Dice any toppings (green onions, cashews). Warm oil in frying pan on medium-high heat. Add the tofu cubes and continuously mix for a few minutes until golden. Turn down to low-medium heat. Add the shredded carrots, garlic, ginger. Sautéed for 3-4 minutes. Add the (optional) vinaigrette to the whole mix when done. Select a leaf, layer on sauce, then tofu veggie mix, then toppings. Add extra sauce if desired. Shopping tip: inspect the romaine head for signs of browning both in leaves and the base – fresh will be white. Green wrapper: Restaurants often iceberg lettuce which is less nutritious but has a nice bowl shape. To get fancy, add a rice paper wrap on the outside to hold it together. Calorie-dense filling: This also works with pre-seasoned tofu such as Soyganic smoked or sriracha. Veggie ground beef crumbles work as well. To make the dish more filling, throw in some brown rice that has been pre-mixed with your chosen sauce (hoisin or peanut). Toppings: The sky’s the limit! Play with different nuts and seeds to add texture and flavour. Credit to supernanny Paula for a perfect tofu sautéed every time!